These banana based, chocolate chip breakfast pancakes are free from grains, gluten, dairy, nuts, and soy. You’re here for the pancakes, so I’m just going to get straight to the point. Sweet, fluffy, JAM- PACKED with pockets of melty dark chocolate and drizzled with warm maple syrup and crunchy almond butter. Your kids will love them. Your man will love them. Your lady will love them. You will love them. 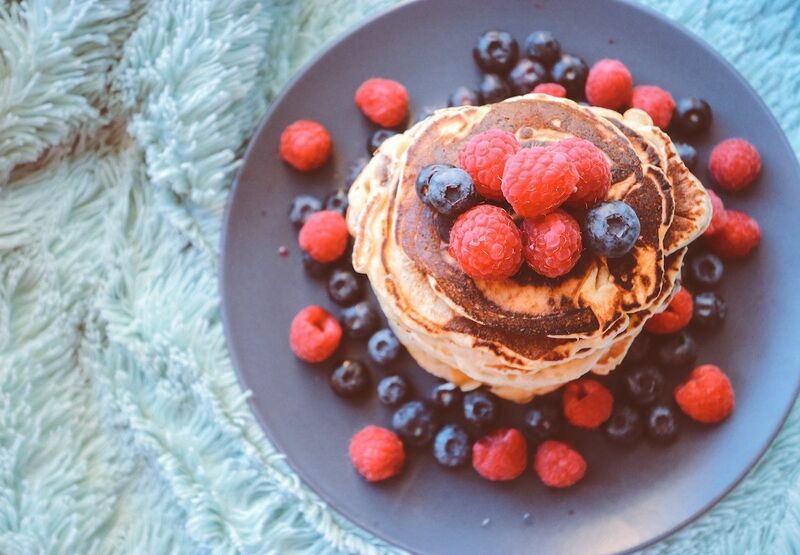 Basically, you can’t go wrong with a stack of these at any time of the day. 1. Peel bananas and blend in your food processor until smooth. 2. Add all of the remaining ingredients (except your chocolate) and process for 2-3 minutes. 3. Pour batter into a large bowl and stir in dark chocolate chunks. 4. In a large frying pan, melt 1 tablespoon of coconut oil over a medium-high heat. 5. When the pan is warm, scoop one ladle of batter into the frying pan until your pancake is the desired size (I recommend you make smaller pancakes as they seem to cook better). 6. Let cook for approximately 4 minutes on the first side, before flipping (always a disaster for me so good luck!) and cooking on the second side for a minute or so. 7. Repeat with the remaining batter, adding a little more coconut oil to your pan as needed. 8. Serve and enjoy! I top my pancakes with pure grade maple syrup, fresh berries, homemade chocolate sauce, melted almond butter, etc.